NEBNext Multiplex Oligos provide adaptors and primers to enable high yield multiplex Illumina library production. 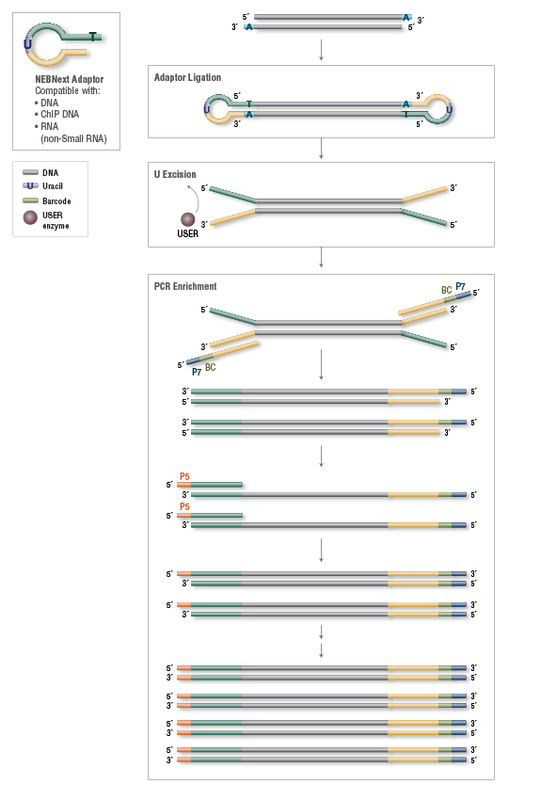 The unique hairpin loop structure of the NEBNext Adaptor minimizes adaptor-dimer formation, and NEBNext index PCR primers enable index incorporation during library amplification. Additional NEBNext Multiplex Oligos products are available with sets of 12 and 96 single index primers as well as dual index primers. Additional single- or dual-barcode primer options are available, in 12- and 96- index formats (NEB #E7500, NEB #E7710, NEB #E7730, NEB #E6609, NEB #E7600). A methylated version of the NEBNext Adaptor is also available for use with bisulfite sequencing protocols (NEB #E7535).